The Thing Itself is a summer group exhibition currently on view at Yancey Richardson Gallery in New York City. Photography is explored as a medium and a subject matter in this show that runs from July 10 until August 22, 2014. As a medium, photography has gone through multiple changes. A change with technological advances occurs whilst there is an ever-increasing movement towards digitization and democratization of our visual cultures. The culture of images, social media’s advancement in the digitization of our social practices, and the media communication has lead to a state where ”there remains almost no materiality to the medium as film, darkrooms, and paper”, they technically recede into obsolescence. Naturally, the artistic response can be many whilst our visual cultures stand for self-reflexivity. But the photographic practices also vary. In The Thing Itself –exhibit, there are works from 16 artists: Mary Ellen Bartley, Anne Collier, Sara Cwyner, Roe Ethridge, Bryan Graf, Bill Jacobson, Kenneth Josephson, Laura Letinsky, Matt Lipps, Vik Muniz, Paul Mpagi Sepuya, Alyson Shotz, Laurie Simmons, Wolfgang Tillmans, Bertien van Manen, and Christopher Williams. When the social conceptions about the images constantly change, artists can now ask what makes something a photograph, what are its new definitions and the practices that define its new physical boundaries. Photography as a subject matter challenges the notion of materiality of photographic prints amongst the digital. The artists have chosen tools and materials of photography including cameras, paper, and scanners, to family snapshots or media images. Self-reflexivity makes the red thread of the show. Kenneth Josephsonʼs 1965 portrait, Matthew, (above), shows technology used in Polaroid where images can be seen/touched immediately. 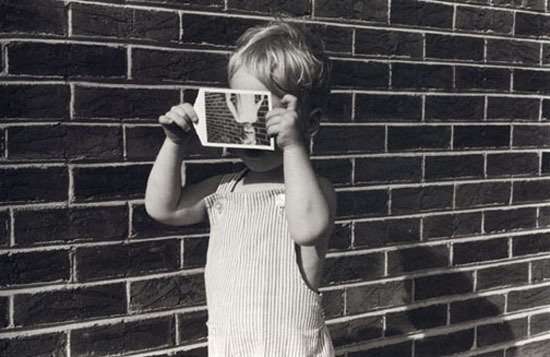 In the photograph, Josephsonʼs son holds a Polaroid image of himself in front of his face, depicting as though holding a camera. 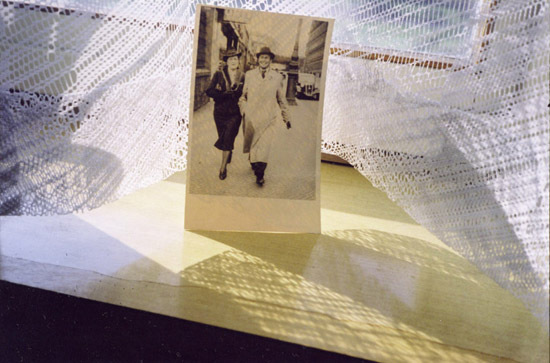 Bertien van Manen’s photograph from 2004, Prague (Couple holding hands) (below) is part of the series Give Me Your Image, where the artist photographed valued family photos in the homes of European immigrants. The waning practice of taking, developing and displaying family snapshots is part of the value of the prints, which as such are both tangible objects and vessels of image and meaning.